On Saturday, December 1, scientists attending the Gravitational Wave Physics and Astronomy Workshop in College Park, Maryland, presented new results from the National Science Foundation’s LIGO (Laser Interferometer Gravitational-Wave Observatory) and the European- based VIRGO gravitational-wave detector regarding their searches for coalescing cosmic objects, such as pairs of black holes and pairs of neutron stars. The LIGO and Virgo collaborations have now confidently detected gravitational waves from a total of 10 stellar-mass binary black hole mergers and one merger of neutron stars, which are the dense, spherical remains of stellar explosions. Six of the black hole merger events had been reported before, while four are newly announced. From September 12, 2015, to January 19, 2016, during the first LIGO observing run since undergoing upgrades in a program called Advanced LIGO, gravitational waves from three binary black hole mergers were detected. The second observing run, which lasted from November 30, 2016, to August 25, 2017, yielded one binary neutron star merger and seven additional binary black hole mergers, including the four new gravitational-wave events being reported now. The new events are known as GW170729, GW170809, GW170818, and GW170823, in reference to the dates they were detected. All of the events are included in a new catalog, also released Saturday, with some of the events breaking records. For instance, the new event GW170729, detected in the second observing run on July 29, 2017, is the most massive and distant gravitational-wave source ever observed. In this coalescence, which happened roughly 5 billion years ago, an equivalent energy of almost five solar masses was converted into gravitational radiation. GW170814 was the first binary black hole merger measured by the three-detector network, and allowed for the first tests of gravitational-wave polarization (analogous to light polarization). The event GW170817, detected three days after GW170814, represented the first time that gravitational waves were ever observed from the merger of a binary neutron star system. What’s more, this collision was seen in gravitational waves and light, marking an exciting new chapter in multi-messenger astronomy, in which cosmic objects are observed simultaneously in different forms of radiation. 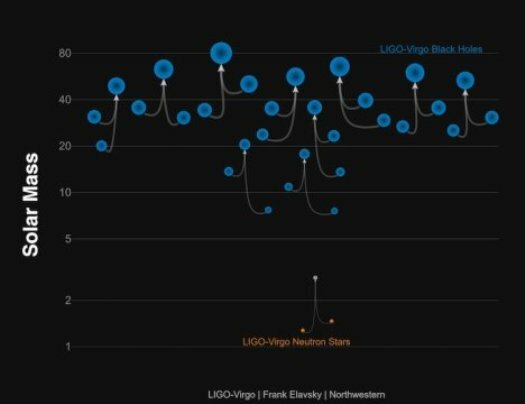 One of the new events, GW170818, which was detected by the global network formed by the LIGO and Virgo observatories, was very precisely pinpointed in the sky. The position of the binary black holes, located 2.5 billion light-years from Earth, was identified in the sky with a precision of 39 square degrees. That makes it the next best localized gravitational-wave source after the GW170817 neutron star merger. “It is gratifying to see the new capabilities that become available through the addition of Advanced Virgo to the global network,” says Jo van den Brand of Nikhef (the Dutch National Institute for Subatomic Physics) and VU University Amsterdam, who is the spokesperson for the Virgo Collaboration. “Our greatly improved pointing precision will allow astronomers to rapidly find any other cosmic messengers emitted by the gravitational-wave sources.” The enhanced pointing capability of the LIGO-Virgo network is made possible by exploiting the time delays of the signal arrival at the different sites and the so-called antenna patterns of the interferometers. “The new catalog is another proof of the exemplary international collaboration of the gravitational wave community and an asset for the forthcoming runs and upgrades” adds EGO Director Stavros Katsanevas. The scientific papers describing these new findings, which are being initially published on the arXiv repository of electronic preprints, present detailed information in the form of a catalog of all the gravitational wave detections and candidate events of the two observing runs as well as describing the characteristics of the merging black hole population. Most notably, we find that almost all black holes formed from stars are lighter than 45 times the mass of the Sun. Thanks to more advanced data processing and better calibration of the instruments, the accuracy of the astrophysical parameters of the previously announced events increased considerably.